My image of Messier 15 The Great Pegasus Cluster. In the constellation of Pegasus, easily found approx 4 degrees north west of the star Enif. 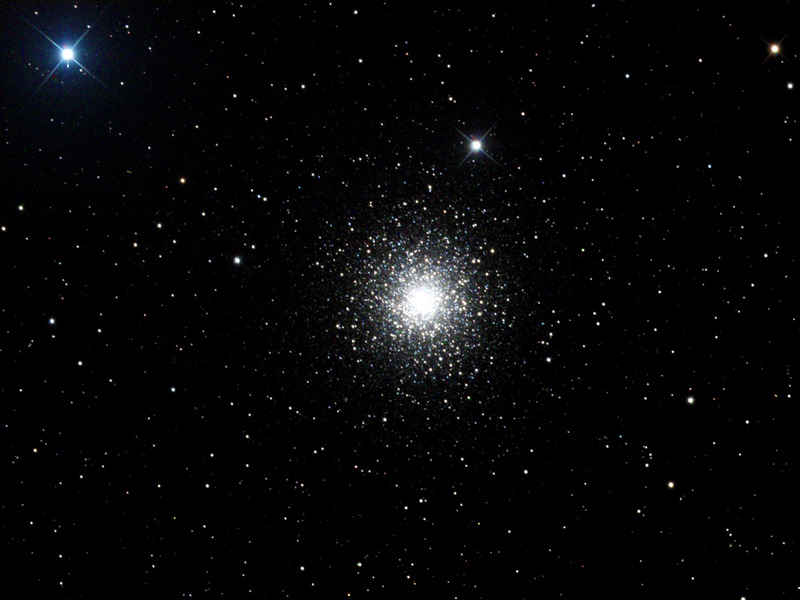 Slightly smaller and fainter than the similar looking cluster of Messier 13 The Great Hercules Cluster, Messier 15 is relatrively bright at magnitude 6.2 and is resolved as a fuzzy star in binoculars and becomes a fine sight in an 8 inch telescope and above. This is a dense globular cluster is nearly 34000 light years distant and home to 100,000 stars. At 12 billion years old, it is one of the oldest known globular clusters , the universe is an estimated 14 billion years. The dense core of the Pegasus Cluster has undergone a contraction called a core collapse and with a black hole thought to be at the centre. This image is made from 21 x 120 second exposures which were stacked together to form this final image. A must see for any Messier hunters.